Augustus, born as Gaius Octavius (63 BC - 14 AD) was the first emperor of the Roman Empire. 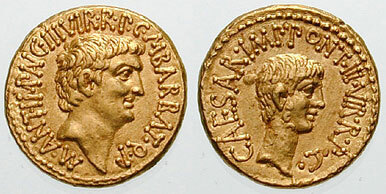 His parents were Gaius Octavius and Atia Balba Caesonia, his wife was Livia Drusilla and his daughter Julia Caesaris. Bronze statue, National Archaeological Museum in Athens, Greece. Portrait as a young man, ca. 27-20 BC, Louvre, Paris, France. provenant de Delphes, collection particulière. Augustus, wearing Civic Crown. Glyptothek, Munich, Germany. Bust of Augustus, dated to around 30 BC. Museo Capitolino, Rome, Italy. Bronze bust of Augustus, dated 27-25 BC. British Museum, London, United Kingdom. Marble bust of Augustus, dated after his death in 14 AD. British Museum, London, United Kingdom. Copy of the statue of Prima Porta in Zaragoza (Roman Caesar Augusta). Bronze statue of Augustus. National Archaeological Museum, Athens. Part of the Res gestae Divi Augusti, Augustus' autobiography. The Roman Empire under Augustus. Expansion of the Roman Empire under Augustus. The campaign of Nero Claudius Drusus in Germania during 12-9 BC under Augustus.